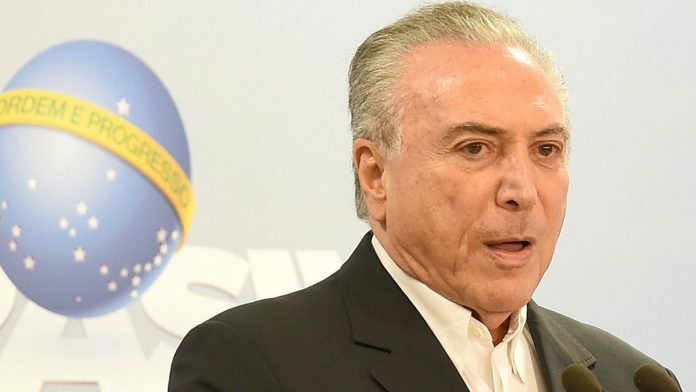 Fighting to save his job amid a mushrooming corruption scandal, Brazilian President Michel Temer told the nation Saturday that an incriminating audio recording of him had been doctored. “That clandestine recording was manipulated and doctored with (bad) intentions,” Temer said at a news conference in capital of Brasilia. Temer said he had filed a petition with the Supreme Federal Tribunal, the country’s highest court, to suspend the corruption investigation into him until experts can analyze the audio that appears to show him endorse the payment of bribes to ex-House Speaker Eduardo Cunha for his silence. It’s unlikely the court would do that, as it authorized the opening of the investigation into Temer in the first place and ordered it made public. Temer noted that the Folha de S. Paulo newspaper reported that the 39-minute recording had been edited. The audio was first reported by Globo newspaper on Wednesday. Temer also questioned the motives of the man who made the recording, JBS meatpacking company executive Joesley Batista. He accused Batista of buying “large quantities of dollars to cause chaos on the exchange market” before giving the tape to prosecutors. Temer’s claims about the audio and Batista couldn’t be immediately verified. In the audio, Temer apparently endorses bribes for Cunha, who is serving a 15-year prison sentence of corruption and money laundering and who led the impeachment push against President Dilma Rousseff last year. Rousseff was eventually ousted for illegally managing the federal budget, bringing Temer, who was her vice president, to power. Temer’s remarks were unlikely to have much impact on the spreading movement for him to resign. Even if the audio was edited, Temer’s words to Batista to keep up the payments to Cunha seem clear. And Temer did not mention the long list of other allegations against him, nor acknowledge that allies have started to bolt. Soon before Temer spoke, the Brazilian Socialist Party announced it was breaking from his coalition. The loss of its seven senators and 35 deputies mean Temer’s ambitious plans to reform the country’s pension system and labor laws are even less likely. The leaders of several other parties in Temer’s coalition also planned to consult with their members Saturday in Brasilia. Brazil’s highest court released documents on Friday revealing that the nation’s top prosecutor is accusing Temer of corruption, obstruction of justice and being part of a criminal organization. In one plea bargain released as part of the tribunal’s document dump, Temer is accused of taking $1.5 million in bribes. In another, Temer is accused of pocking about $350,000 of $4.5 million in illegal campaign finance channeled by the Workers’ Party for the 2014 presidential ticket that included Temer as vice presidential candidate. The calls for Temer to resign have been joined by Globo, the flagship paper of Brazil’s biggest media company, which had been supporting the president’s legislative program to boost an economy mired in its worst recession in decades. The company generally wields enormous influence among Brazilians because of its popular soap operas and media dominance. “The president has lost the moral, ethical, political and administrative conditions to continue governing Brazil,” O Globo said in an editorial. Attorney General Rodrigo Janot’s formal presentation of evidence was an extraordinary development in a corruption probe that is upending politics and just about everything else in Latin America’s largest nation. Janot accused Temer and Sen. Aecio Neves of trying to derail the three-year-old “Car Wash” investigation into a huge kickback scheme at the state-run oil company Petrobras via legislative means and by influencing police investigators. Because the case involves a sitting president, the process is different than in any other kind of criminal case. With a formal investigation now opened, Janot’s will now decide whether his case is strong enough to send it for consideration by the Chamber of Deputies in Congress. If at least two-thirds of the members of the lower house voted in favor, the case would be sent back to the top court, which would then decide whether to put Temer on trial. If the court decided to try Temer, he would be suspended from office for up to 180 days. A conviction would permanently remove him from office. At least eight pieces of proposed legislation to impeach Temer have been submitted in Congress. Temer’s speech failed to impress patrons watching him on television in a Rio restaurant. Retired teacher Adilson dos Santos was equally unimpressed with Temer’s words. “All this corruption is regrettable and as a Brazilian I feel shame,” he said. Brazilian President Michel Temer is trying to save his presidency. Temer filed a petition with the Supreme Federal Tribunal, the country’s highest court.